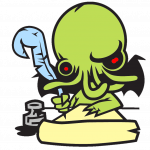 A few weeks ago, I mentioned I had a new story available in the November issue of the Lovecraft Zine. Last week, Mike uploaded the free podcast version of the issue which is available here. I thought the readers did a smashing job and really add great characterization to these sordid tales. Speaking of sordid, I’m finishing up another Lovecraftian tale — this one set in Europe at the turn of the century. The other day, I was just remarking on all the everyday things we take for granted that they didn’t have back then. Airplanes were just beginning to emerge, cell phones and television sets were nonexistent, along with many other household appliances and technology. Even beyond that, consider the food and the way people dressed. It was unheard of for a woman to walk down the street in a tank top and sweatpants. All these things, coupled with superstitions and a rapidly-changing world, make for an interesting time period. Once that story is done, then that’ll complete the unholy (though, unrelated) trilogy of tales, the second being the newly released “The Button” from the We Are Dust anthology — which is now available on Amazon, too. Writing Lovecraft-inspired stories is a lot of fun; I feel like there’s always some new corner of his ‘verse and style to explore — whether that’s a direct translation or not. Perhaps that’s why I really loved Boom! Studios comic interpretation of Cthulhu, because the visual form (coupled with the necessary word conversation required) really lent itself to a stunning interpretation in the Fall of Cthulhu and Cthulhu Tales series. In the “useful skills to survive a zombie apocalypse” category, I’ve acquired chainmaille-making skills, focusing on aluminum rings. (Which, incidentally, are a HECK of a lot lighter than other metals.) The trick to bending and weaving appropriately, is to a) be a touch obsessive-compulsive b) have the proper tools and c) realize that yes, indeed. Size does matter. Anything seed bead or ring or component-related requires proper measurements to ensure that the elements fit together. (If seed beads or crystals aren’t cut precisely, it can throw a pattern off, too.) The important thing to remember with rings is that math is important! There is the inside diameter, outside, and gauge of wire to consider. Not to mention, what type of weave (4-in-1, Persian, Japanese chainmaille, etc.) you want to make. But I digress. 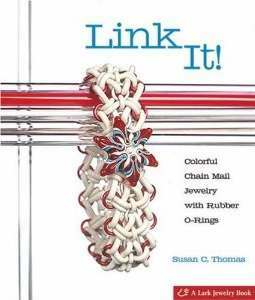 There’s a few books on the subject for jewelry-making purposes that are pretty outstanding. 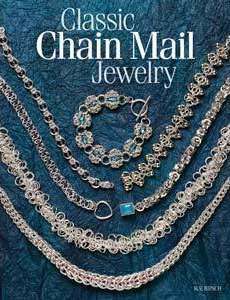 Classic Chain Mail Jewelry, which highlights my favorite weave — Byzantine — includes a ton of ideas for earrings, bracelets, necklaces and the like. There’s also an international organization of chainmaille specialists (http://www.mailleartisans.org) that offer a variety of weaves for you to peruse. Materials can get somewhat expensive especially if you’re working with natural metals (e.g. gold, silver, etc.) I focus on aluminum, copper, and rubber primarily, but the biggest trick I’ve learned to reduce cost of materials is to have a pattern that you want to make and budget for 10% extra (in case you screw up). Buying rings for the sake of purchase can put a real dent in your budget. Bonus achievement unlocked! Don’t think I’ll have to spend much time researching types of weaves (and what they look like) for any story of mine. Though, the only real ditty I’m missing is what era these individual basic patterns hail from. (Chainmaille in general dates back to 400 B.C. and there are over 1,000 weaves documented.) Which is funny, because you’d “think” there’d be a historical book on the topic, but alas… Likely in the armor section. Mood: Inquisitive with a side of eyebrow raise. Work-Out Minutes Logged Yesterday: Some monstrosity of an elliptical machine. Another Christmas has come and gone, and this year’s presents included an eco-friendly watch from Sprout. Mine (which isn’t pictured on the company’s website) is a purple cotton band, a purple and white face, with a black raven sitting on a branch. I’ll likely doctor up the lavender band a touch with these paint markers and either add some scrollwork or branches and more crows/magpies/ravens. The band is a bit “too” simple for my tastes. The watch is, indeed, eco-friendly. A bamboo dial, plastic made out of corn resin, and a cotton band. (Also: allergy-free.) The box I can turn into a mini-garden; it even came with a packet of grass! I have a solar-powered affair, a white watch from Casio, but I’m always forgetting how to ensure the date/time are correct. (Which is funny, considering there’s even an eHow article on the subject.) And another art watch that’s so springy (the season, not the bounce), my wrist turns green when I wear it. Haven’t really worn a watch much last year but — and this is a big “but” I suppose — wearing one means I don’t have to check my phone and, subsequently, get distracted by other notifications when I see the time. Being plugged in is a necessity for what I do, so it’s something I have to manage. After all, writing and beading and art — in any capacity — requires little to no internet, unless I’m using search for reference material. To wear or not to wear… A watch. That is the debate. 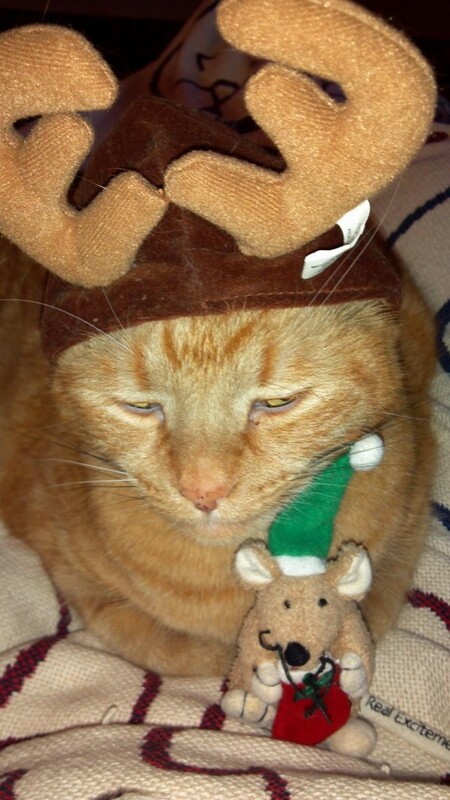 Mood: Post hot buttered rum blah. Caffeinated Beverages Consumed: Enough to counteract the millions of pounds of fudge I ate. I felt this article was really interesting because it talks about how one writer gets through the plateaus. “Salesmen chase five times the number of leads to bring in the one real sale so it’s all the same. His solution, to get through those slow times, is to fall back on self-publishing regardless of whether or not the work sells because you’re still productive. I think this is an interesting approach and while it’s not something I would default to, it certainly brings up the question about what writers should be doing when you hit a plateau. For that reason alone, the article is definitely worth a read.